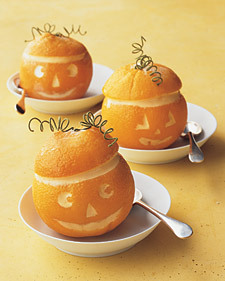 These little Jack-o’-Lanterns are made with oranges. 1. Cut off the top of an orange. 2. Scoop out flesh with a spoon, then carve eyes, noses, and grins with a utility knife. 4. For the “pumpkin” lid, bend floral wire and poke it in (not through) top of orange. And that’s it! These make perfect fall desserts! what a cute idea for halloween! Thanks for sharing! !